Allegany State Park in Cattaraugus County, southwestern NY, covers 65,000 acres of largely forested upland, an area unique in the State for having been ice-free during the Pleistocene glaciation. Extensive studies by the New York State Museum were conducted in 1920s and 30s on its fauna and flora, including birds (Saunders 1942, Baird 1990). Saunders (1942) first reported the Northern Saw-whet Owl breeding in Salamanca, NY, an area just outside Allegany State Park. The fact that it does breed here has been established (Beardslee; Mitchell 1965, Levine 1988) but there are exceptionally few records that exist. Many ornithologists believe that the saw-whet has been easily overlooked (Eaton 1914, Bull 1974, Levine 1988) and maybe one of the most common owls across southern Canada and the northern United States (Cannings 1993). Each autumn the Northern Saw-whet Owl leaves its breeding range to migrate to its wintering grounds (Holroyd; Woods 1975, Weir; et al 1980). They winter in the south from central Florida to the Atlantic states (Lindsay 1998). Lake Ontario has recently revealed, with the use of mist-nets, that large numbers of saw-whets are moving through New York State (Slack; Slack 1987, Lindsay 1998). Aside from the counties along the Great Lakes and the coast of New York, there is scant information recorded regarding migration numbers from inland locations like Allegany State Park. 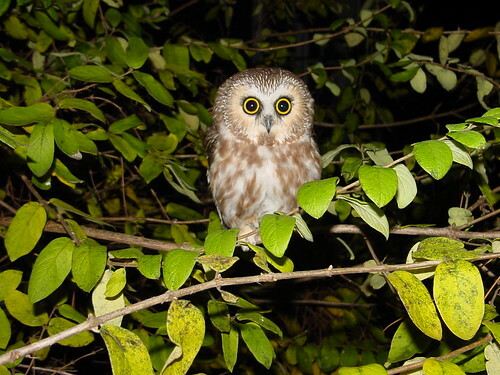 This study is providing additional information on the natural history of the Northern Saw-whet Owl in the Allegany State Park area with the use of audio lures and mist-nets. Since 2004 the station has banded over 162 owls and captured 6 birds from other banding stations (5 Ontario, Canada, 1 Pennsylvania, USA). We hope to increase the number of foreign recaptured birds and assists ornithologist in the understanding of Northern Saw-whet Owl migration routes across North America. Still, much remains to be learned about the Northern Saw-whet Owls population size, distribution and breeding biology across North America. The understanding of the breeding and migrating ecology in Allegany State Park will be of interest to wildlife managers in this particular area of the state and increase public awareness of the conservation needs for this small owl. Cannings, R.J. 1993. 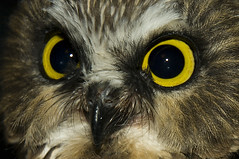 Northern Saw-whet Owl (Aegolius acadicus). In the Birds of North America, No. 42 (A. Poole and F. Gill, eds). The Academy of Natural Sciences, Philadelphia, and the American Ornithologists’ Union, Washington, D.C.
Holroyd, G.L. ; Woods, J.G. 1975. 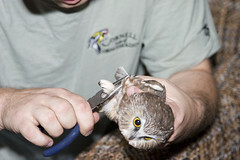 Migration of the Saw-whet Owl in Eastern North America. 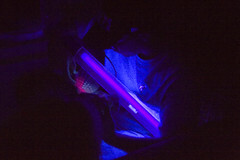 Bird Banding. 46(2): 101-105. Weir, R.D. ; Cooke, F.; Edwards, M.H. ; Stewart, R.B. 1980. Fall migration of Saw-whet Owls at Prince Edward Point, Ontario. Wilson Bulletin. 92(4): 475-488.